Greece formally requested a three-year bailout from the eurozone’s rescue fund Wednesday and pledged to start implementing some of the overhauls demanded by creditors by early next week, according to a copy of the request seen by The Wall Street Journal. Crucially for Greece’s creditors, the letter says the government would start implementing some measures, including on taxation and pensions, by the beginning of next week, though it doesn’t go into details. The letter is a first step toward fulfilling a demand by international creditors, who have given Athens until Sunday to come up with tougher measures they would impose in return for desperately needed financing that could keep the country from bankruptcy and even worse economic turmoil. The resistance by the government in Athens to implement economic-policy overhauls and budget cuts has held up a deal between the two sides for months, and raised the specter of an imminent Greek exit from the eurozone. Prime Minister Alexis Tsipras said earlier Wednesday that his government would present concrete and detailed overhaul measures in the coming days. The full list of overhauls and budget cuts is what will determine whether the application for a new rescue program will be approved by the rest of the eurozone. The currency union’s leaders said Tuesday they would assess whether it makes sense to start formal negotiations on a bailout program at an emergency summit on Sunday. 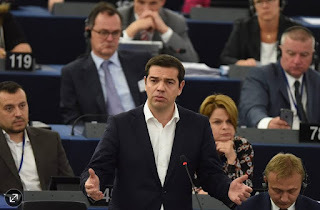 In his first address to the full European Parliament in Strasbourg, Mr. Tsipras mixed conciliation with defiance, pointing to his countrymen’s resounding “no” vote in Sunday’s national referendum as evidence he has a fresh mandate to demand a good deal for Greece. “We demand an agreement with our neighbors but one that gives a sign that we are in a long-lasting basis for exiting from the crisis,” he said. Without some new cash in the coming weeks, Greece won’t be able to make a €3.5 billion ($3.8 billion) bond payment to the European Central Bank on July 20. Such a nonpayment could push the ECB to cut emergency lending to Greek banks—a move that would send the country’s financial system into meltdown and force the government to print its own money to recapitalize them. The letter from Finance Minister Euclid Tsakalotos to Jeroen Dijsselbloem, the chairman of the Eurogroup of finance ministers, and Klaus Regling, the managing director of the European Stability Mechanism—the European bailout fund—overtakes a request from last week for a two-year rescue program. A spokesman for the fund confirmed it has received Greece’s request for a new loan. Finally, the letter also makes a request for debt relief, albeit in much more toned-down language than earlier demands. “As part of a broader discussion to be held, Greece welcomes the opportunity to explore potential measures to be taken so that its official sector related debt becomes both sustainable and viable over the long term,” the letter says. Eurozone finance ministers won’t be discussing the request Wednesday as had been expected, said a spokesman for Jeroen Dijsselbloem, the Dutch finance minister who leads the discussions among his eurozone counterparts. The request will be dealt with in a teleconference by senior officials from national finance ministries instead, he added in a message from his Twitter account. Germany has opposed the Greek government’s bid for debt relief, though officials have suggested they might be open to the possibility if the government commits to overhauling its economy. The IMF, Greece’s biggest creditor outside the eurozone, has long insisted that high debt has been weighing on growth and that the currency union’s governments should take action to reduce it. Greece's creditors - the European Commission, the European Central Bank (ECB) and the International Monetary Fund - have already provided more than €200bn in two bailouts since a rescue plan began five years ago. Greece has meanwhile formally asked the European bailout facility - the European Stability Mechanism - for help. In addition, the ECB's governing council is discussing its emergency lending for Greek banks, though no change is thought likely before the weekend. Since last week, the ECB has refused to extend lending. There was a softness in the tone of Alexi Tsipras which shows he knows how to appeal to an audience. For the first time he stated explicitly that the problems facing Greece are not just the fault of the evil creditors. He said that for decades corruption and a "politico-economic nexus" had been given a free hand - and that his government was committed to ending that. He also reached out to other peoples "suffering under austerity" - a sign that he can see how it might hurt elsewhere in Europe for Greece to get special treatment. But on specifics, there was nothing. Certainly none of the detail which is supposed to be put down on paper between now and Friday. Instead, backed by his referendum victory on Sunday, Mr Tsipras stood his ground. Any deal had to offer the prospects of growth, and it had to include discussion of Greek debt. Does he actually have anything more to offer the eurozone? We still do not know. EU Economy Commissioner Pierre Moscovici told the BBC's Today programme that Europe wanted to stop Greece falling out of the euro. "The Commission does not want a Grexit. Grexit would be a terrible failure and we are fighting to avoid it." But, first, he said proposals must come from the Greek side. "They know what they have to do, they know what we expect". "Greece has not caved. This is a formality. Greece needs to accept and sign an MOU. This has not happened. Greece has asked the ESM for assistance. However, the ESM only gives money based on strict conditionality, i.e. memorandum. This has not been agreed as of yet by Greece and Europe. Greece will present its proposals tomorrow. If they are not accepted and everything collapses then on Sunday European leaders would start plan B. My comment that "All paths appear to lead to drachma" still holds. Please put the date of publication as events change all the time." I hope that everything I say in this note would prove totally wrong and for me to look a total fool, but it is hard to map any good scenarios given the financing facts, the politics and the behavior on the ground and in Europe. Given the recent events but also the economic situation it is very hard to make scenarios that do not lead Greece out of the Euro. In other words, it looks almost inevitable that Greece would regain its monetary sovereignty in a disorderly way. What is not known is the timing and the path. Many have talked before about a negotiated exit, a golden parachute and the rest. This is no longer the case as it is politically impossible. No Greek politician would like to be the one that would negotiate an exit and his name written in history as such. No European politician wants his fingerprints on the trigger either. Of course now they have the perfect political excuse. Europe did say that a NO vote would be taken as a NO to Europe. Everyone has his own interpretation of the question and the result. This means one thing only. Greece is going to exit in a disorderly and hard way from the Eurozone and there is a high possibility of exiting the union too. Greece would be left to descent towards the Drachma with this becoming the only “patriotic” solution. There is no political force within Greece that can stop it or has the weight and the respect of the people. Thus, it may get ugly. Already in Brussels they are talking of humanitarian aid to Greece. The timing is not easy to calculate. Tsipras is going to Brussels buoyant with his recent “NO” win. He thinks that he would get a better deal. He has promised to bring back a deal no matter what. This may prove much harder to do and impossible to implement. Let us assume for a minute that Tsipras strikes a deal with Europe. Would this deal be enough to lift capital controls and the limits to withdrawals? Would faith in the system be restored quickly? Probably not. Banks are bust and in a cash economy heavily reliant on imports this means suicide. Everyone is hoarding his cash fearing the worst. Thus, we are looking at a huge drop in the GDP some say bigger than 5%. Unemployment currently close to 26% would explode. And all this coupled with reforms and yet more taxes and cuts spell one thing only, unrest and Drachma. Tourism, which is the one and only industry currently in Greece, would suffer massively. Uncertainty and instability over the future is not good for non-adventure seeking holiday-makers. Financing needs of Greece are just the tip of the iceberg. Greece would instantly need at least €40-50bln in order to restore calm and faith. But Tsipras also faces another problem. His credibility is below zero and it would be very hard for Europe to give more concessions to him, thus seemingly rewarding his reckless policies that are bringing so much misery to his people. There is no opposition to him. He is the rainmaker in Greece. If on the other hand there is no deal then all hell may break loose. Banks would be impossible to reopen even with limits and the next deadline which is on the 20th July when ECB needs to be repaid €3bln would be the end. Deposit haircuts may be introduced or at least threatened. Greece would be with both feet outside the monetary union. Tsipras of course still commands huge popularity with the Greek people and it would be easier for him (and given his rhetoric) to lead Greece to Drachma and simultaneously blame the bad foreigners and the Germans as he has done over the past few years. He is the master of all politics in Greece and he has played the nationalistic game very well. And every time a leader played the nationalist card, Greece suffered a catastrophe in social, economic and in human terms. Again, I emphasize Andreas Koutras sent me this apocalyptic comment Tuesday morning before the Eurogroup meeting. Is Andreas right? Do all roads lead to Grexit and drachma? That all depends on the proposals Greece will put forth on Thursday and whether this SYRIZA government is serious about implementing some tough reforms that are sure to anger some of the party's extreme left-wing members and even other right-wing (ALEK) members of its minority coalition government. So Syriza called the referendum. To their consternation, they won, igniting the great Greek revolt of 2015, the moment when the people finally issued a primal scream, daubed their war paint, and formed the hoplite phalanx. Mr Tsipras is now trapped by his success. "The referendum has its own dynamic. People will revolt if he comes back from Brussels with a shoddy compromise," said Costas Lapavitsas, a Syriza MP. "Tsipras doesn't want to take the path of Grexit, but I think he realizes that this is now what lies straight ahead of him," he said. What should have been a celebration on Sunday night turned into a wake. Mr Tsipras was depressed, dissecting all the errors that Syriza has made since taking power in January, talking into the early hours. I must admit, part of what Evans-Pritchard writes makes sense, but I have a hard time swallowing that Tsipras was praying for a Yes vote. He campaigned vigorously for a No vote and his lieutenants spread lie after lie in an attempt to put the blame on the ECB and creditors for the capital controls and the misery Greeks are suffering now. In any case, it doesn't really matter. As I stated in my last comment on Greece's return to Ithaca, the SYRIZA show is over and it's about time Greeks realize that Greece has been taken hostage by a government disguising its incompetence as heroism. Are Greeks right to be hopping mad over asinine austerity measures that keep sinking their economy into a never-ending debt-deflation spiral? Of course, the troika also proved itself to be willfully incompetent. Instead of offering meaningful debt relief and growth projects in exchange for deep job cuts in Greece's bloated and inefficient public sector, it implemented austerity measures that disproportionately hurt the Greek private sector, leaving the public sector largely intact. But the referendum is over. Greeks owe billions to creditors and they overwhelmingly want to stay in the eurozone. Their elected government has to realize that in order to avoid Grexit, they now have to implement harsh reforms which will offend their party's base and possibly throw the country into new elections. In other words, Greeks gambled on SYRIZA and they lost. The country is in much worse shape now than ever before. The ball is now in the court of Mr. Tsipras and his government. I hope they take the right decision and offer creditors meaningful reforms which finally show they are serious about staying within the eurozone. But whatever happens next in Greece, it's clear that the eurozone is a farce. It's basically all about Germany and many disillusioned Europeans suffering from unemployment and harsh austerity measures are taking note of what is going on right now in Greece. Even Germans are increasingly worried about how they are perceived in the rest of Europe, and rightfully so. Creditors have a choice to make an example of Greece for the better or for the worse. I've repeatedly warned all my readers, global deflation is coming, and what is going on in China will have far-reaching implications for the decade ahead, much more important than what is going on in Greece and the eurozone. "I think we should take into consideration the Greek referendum and try to find a more balanced approach, a more compromised approach that would also find, produce less austerity because this is the message and a more viable solution to the Greek problem," he said. A lot of tough talk but we shall see exactly what the Greek government is ready to concede in the next few days and whether the wider eurozone members and potential members are ready to accept its proposals. I'm taking the rest of the week off to relax and enjoy the nice weather. I'll be back on Monday. Please remember to contribute to my blog via PayPal at the top right-hand side and show your appreciation for my comments. Thank you and have a great rest of week!